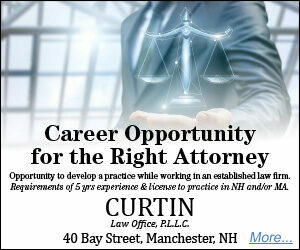 Curtin Law Office, P.L.L.C., has been part of the Manchester community for more than a decade. We focus on helping clients anticipate, respond to, and plan wisely for all the realities and "what ifs" in life. Our team of attorneys and staff has knowledge and experience in all aspects of estate planning, including the preparation of wills, financial and health care powers of attorney, revocable trusts and irrevocable trusts. In addition, available legal services also include elder law and Medicaid law and planning for long term care needs and the high cost of nursing home care. Part of what makes the Curtin Law Office unique is how we deliver our legal services to clients. We appreciate your visiting our website today, and hope you find the information and resources helpful; please contact us directly if we can be of help in any way. Wondering how well-protected you might be with respect to estate planning or elder law? free online assessment and find out! A key objective of the Curtin Law Office is to provide innovative legal solutions. Important information and updates in elder law and estate planning are easily accessible via our free e-newsletter. We distribute approximately four issues per year, each presented in a concise format. Wondering how well-protected you might be with respect to estate planning or elder law? Take our free online assessment and find out!